It’s time to get your curl on—Upper Valley Curling’s 13-week season is starting October 11 at Hartford’s Wendell A. Barwood Arena. So what’s curling? Chances are you’ve seen the sport during a previous Winter Olympics. Played on ice, it’s the event where a player slides a large stone (called a rock) down the ice while two team members sweep the ice in front of the stone with brooms. UVC hosts Learn to Curl sessions throughout the season. 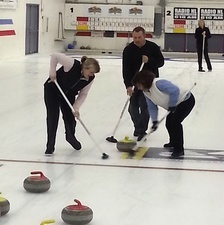 The cost is $25, or $50 for a learn to curl package that includes two Saturdays of drop-in curling. Keep an eye on the club’s website (www.uppervalleycurling.org) for upcoming dates. 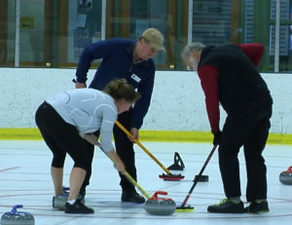 Wednesday Night League Curling will start Wednesday, October 11, and run from 5:40 to 8:10pm. Saturday nights will be League and Social Curling, which will offer opportunities for both team play and drop-ins (on a space-available basis). Saturday night sessions start Saturday, October 14, and will run from 5:45 to 8:15pm. The cost to curl as a team member in either the Wednesday night or Saturday night league is $325 per person. Curlers who want to be on a team for both nights pay $650. Payment is due on or before the first night of league play. Curlers who have signed up for team play are eligible to sub on any night when they are not scheduled to play. Wednesday night league players may pay the drop-in fee to curl on Saturday nights (space permitting). 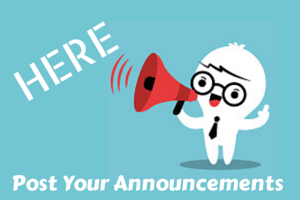 The drop-in fee is $25 for club members and $30 for nonmembers. Following the extended league season, there will be a six-week season that runs from February 3 through mid March. Visit their website, www.uppervalleycurling.org, to sign up!